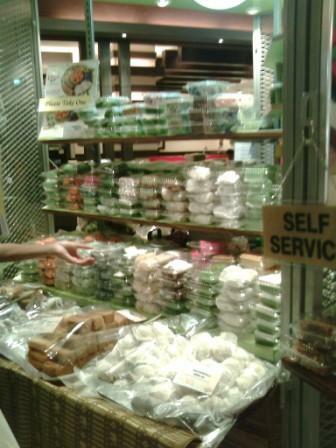 Nowadays, shopping malls have little kiosks selling various kuih muih or delicacies like Nyonya kuih, kuih koci, karipap (curry puffs), lobak kuih (made from carrot), ang kueh and so many more. Usually, I would suggest that if you buy directly from the market (either the day or the night market)- as it is so much cheaper and fresher. 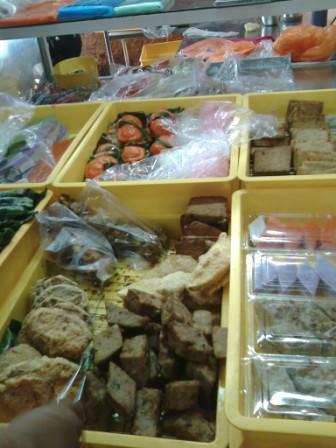 Below is taken from a stall in the market that sells various varieties. Sometimes, if you go to the market around 10.30 to 11am when the stall owner want to close, there may be some discounts. Still, sometimes it is not easy to search for a market- and thus, such kiosks at the mall provides convenience. Once, we bought our visitors some of this kueh from a kuih kiosk in Sungai Wang and our visitors absolutely love the kuih. Nyonya kuih are unique and not found Western countries- so it’s a good idea to give your visitors a try. I am interested to market your products in India.Pls contact me asap.